What vitreous enamel, also called porcelain enamel or enamel, is. You are here: Home > Vitreous Enamel > What is vitreous enamel? Vitreous enamel, also known as porcelain enamel or enamel, is produced by using heat to fuse powdered glass, along with certain oxides, clay and various minerals, to a substrate such as metal, glass or ceramic. It is the variable combinations of the oxides, clay and minerals that produce the wide range of available colours. The glass-like, non-crystalline (vitreous) surface of enamel has many desirable physical properties, with a wide, ever increasing, range of applications. Vitreous enamelled steel combines the traditional properties and attributes of glass with the strength and fabrication flexibility of steel. Vitreous enamel should not be confused with enamel paint which is a liquid that after application in a thin layer onto a surface dries to form a solid glossy finish. Vitreous enamel is inorganic (not carbon based) whereas enamel paint is organic (carbon based molecules). 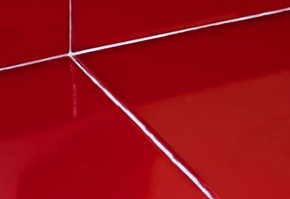 Please click here to download a PowerPoint presentation from Vitrex specifying the properties and uses of vitreous enamel steel (PowerPoint 4005kb).